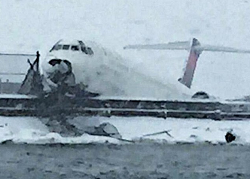 On landing runway 13 in snow, the MD-88 exited the left side of the runway coming to rest on a dike. The pilot of a preceeding aircraft reported the braking action on runway 13 is from medium (touchdown zone) to poor (roll-out and taxiway „Mike“). United flight UA 694, an Airbus A319, which landed on runway 13 about 10 minutes before Delta 1086 reported the braking action as „good“. 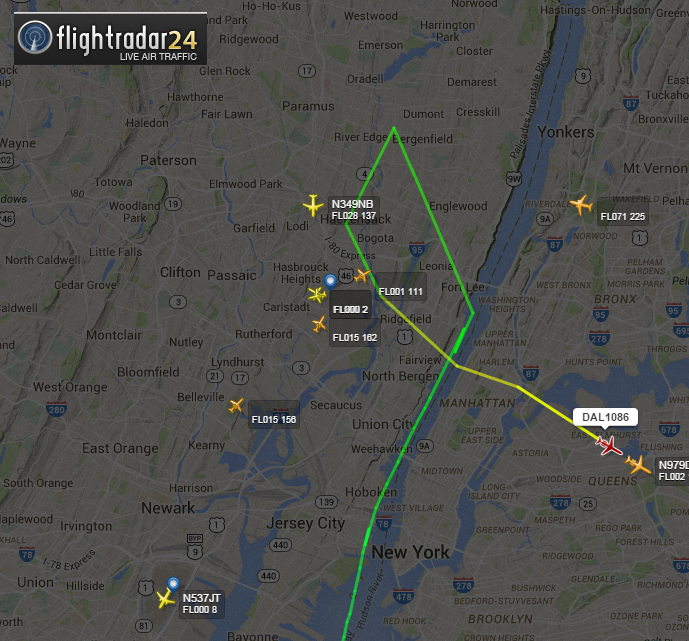 Delta flight DL 1086 then requested „Windcheck“ on short final. The tower replied accordingly. 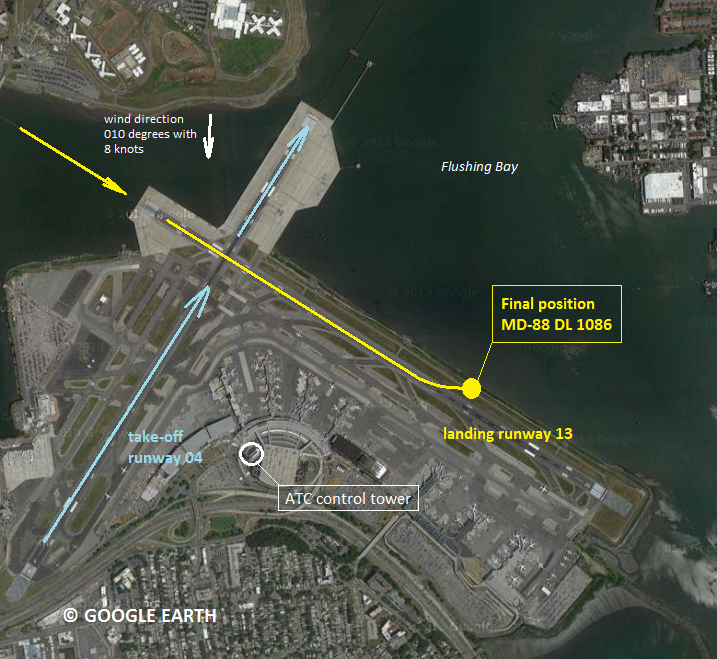 After the landing, local tower controller called flight 1086 several times without reply, then raised alarm. 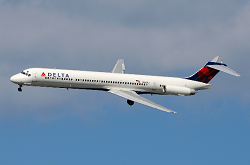 Passengers evacuated via starboard overwing emergency exits and the seperated tailcone(only available on MD80s). The nose tear down the airport fence over about 30 meters before coming to rest. The nosecone, nosegear and foreward underbelly sustained major damage. 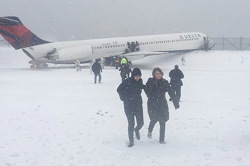 At the time of the incident, local weather consisted of intense snowfall causing many delays to flight in the New York area. Constant operations of snow removal vehicles is required. On 2016-09-13 the NTSB published the final report including the probable cause. The National Transportation Safety Board determines that the probable cause of this accident was the captain’s inability to maintain directional control of the airplane due to his application of excessive reverse thrust, which degraded the effectiveness of the rudder in controlling the airplane’s heading. 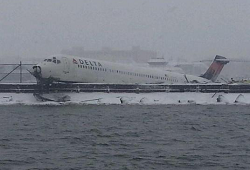 On March 2nd 1994, at nearly the same spot, another MD80 ended on top of the dike behind the end of runway 13 at La Guardia Airport.